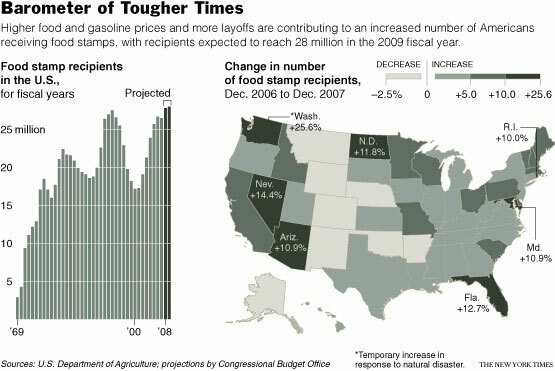 Some states have experienced more recent surges. From December 2006 to December 2007, more than 40 states saw recipient numbers rise, and in several – Arizona, Florida, Maryland, Nevada, North Dakota and Rhode Island – the one-year growth was 10 percent or more. Because they spend a higher share of their incomes on basic needs like food and fuel, low-income Americans have been hit hard by soaring gasoline and heating costs and jumps in the prices of staples like milk, eggs and bread. At the same time, average family incomes among the bottom fifth of the population have been stagnant or have declined in recent years at levels around $15,500, said Jared Bernstein, an economist at the Economic Policy Institute in Washington. The benefit levels, which can amount to many hundreds of dollars for families with several children, are adjusted each June according to the price of a bare-bones “thrifty food plan,” as calculated by the Department of Agriculture. Because food prices have risen by about 5 percent this year, benefit levels will rise similarly in June – months after the increase in costs for consumers. Advocates worry more about the small but steady decline in real benefits since 1996, when the “standard deduction” for living costs, which is subtracted from family income to determine eligibility and benefit levels, was frozen. If that deduction had continued to rise with inflation, the average mother with two children would be receiving an additional $37 a month, according to the private Center on Budget and Policy Priorities. Both houses of Congress have passed bills that would index the deduction to the cost of living, but the measures are part of broader agriculture bills that appear unlikely to pass this year because of disagreements with the White House over farm policy. Another important federal nutrition program known as WIC, for women, infants and children, is struggling with rising prices of milk and cheese, and growing enrollment. The program, for households with incomes no higher than 185 percent of the federal poverty level, provides healthy food and nutrition counseling to 8.5 million pregnant women, and children through the age of 4. WIC is not an entitlement like food stamps, and for the fiscal year starting in October, Congress may have to approve a large increase over its current budget of $6 billion if states are to avoid waiting lists for needy mothers and babies.